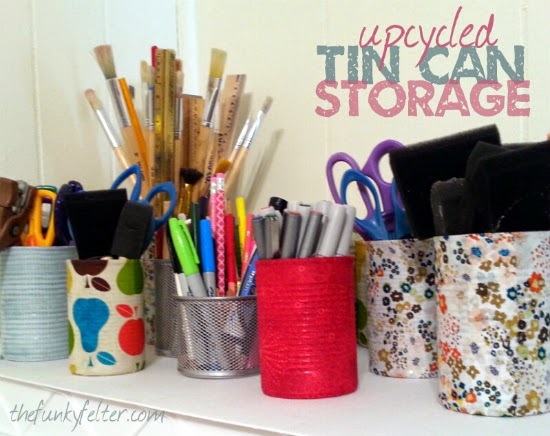 Upcycle those plain tin cans with a little fabric and glue! My craft storage is overflowing and somehow continues to grow. I use to stick things in plastic storage drawers and bins, but then I'd forget that I had materials and tools and end up buying more (probably the reason it grows so much!). Lately I've also had an obsession with saving recyclables, like these tin cans, so I thought I'd put them to good use as storage. It is a win/win because I have cute, decorative storage and am now able to see what I have on my shelves. Maybe it will tamper down the craft purchases. LOL! Now we all know that won't happen. Can I hear an "amen" from my fellow craft addicts? But at least I'll have a cheap and pretty storage solution for what craft supplies I do accumulate. Gotta save money somehow (and most likely not on curbing craft supply purchases in my household)! These are easy to make using fabric scraps and thick, white decoupage glue. Just cut your fabric strips a little longer and wider (about an inch or so on both sides) than the circumference and height of your can. Coat the can with glue and press the fabric to it. I used a sponge brush to help smooth the fabric down onto the can. And, be sure to overlap the ends, top opening and bottom of can with a little fabric - that's the inch or so extra you added in when cutting the fabric. Once the fabric dries in place (about a half a day or so), coat it all again with glue to seal. You can trace the bottom of the can and add a circular piece of felt or canvas to it if you want or leave it open since no one will see it anyway. I made about 10 of these in a couple of hours not including drying time in between glue coatings. Need some more excellent craft storage ideas? Check out my Desks and Storage board on Pinterest. I have pinned lots and lots and lots of neat DIY storage ideas for crafters. I tell myself I'll get around to doing many of them someday, but there really aren't enough hours in the day for me to experiment and make all the crafts that I pin...you know what I mean? Anyway, enjoy browsing and drumming up ideas!